Traditionally IT-led responses to major disruptions that affected businesses were once contingency planning and disaster recovery. However, over recent years there has been a growing recognition that they need to become a business-led process that encompasses preparations for many forms of disruption. 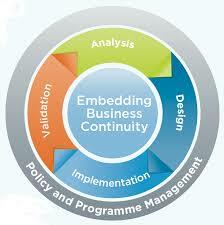 Business Continuity Management (BCM) is a recognised discipline based on the life-cycle shown below. To help you assess your state of readiness, the Business Continuity Institute has prepared a short self-assessment questionnaire covering seven key business areas. Businesses need to prove that they can operate, therefore, having a BCM will provide an opportunity to promote a well managed business. Some organisations have gone further with independent audits of their BCM system. Have you got a plan in place to reduce the level of risk to your customers? Have you quantified the impact to your business of losing customers due to a major disruption? People play a key role in recovering from a major disruption. Aside from a duty of care to your staff, if you cater for their needs they can concentrate on keeping you in business when you need them most. Do staff contracts give the flexibility in terms of working hours, location and role to deal with a major disruption? Are contact details up-to-date for all members of staff? Do staff members know what to do if the office becomes inaccessible? When staff leave, what is the impact in terms of loss of skills and experience? Consider cost savings by reducing headcount, selling sites or cutting investment to reduce business resiliency. Having a BCM will help you to understand this change. Companies can also use BCM to achieve savings on their business insurance premiums. Have you considered the underlying vulnerability of the business to unexpected disruptions? Will your insurance company offer a reduction in premiums for having an audited business continuity plan? Reliance on a single critical provider can be a risk. Understanding how they would recover from disruption, where you feature in their priorities, and the potential impact on you is important. Are you reliant on a supplier providing you with a key service or product? Have you quantified the impact to your business of losing a critical supplier and how long it would take to find an alternative source? Do you know the current financial and general health of your important suppliers? One of the most frequent disruptions experienced by companies is the failure of IT and telecommunication systems. Ensure critical data is appropriately backed up and accessible to enable a timely recovery? Consider moving away from a dedicated IT infrastructure to hosted capacity and applications delivered over the Internet? How robust are the technologies that your business relies on? Disruptions lead to a loss of site access and some companies have arrangements in place to move to a temporary location during this disruption. Have you identified alternative office options to use in case of a major disruption? Do you have the ability for staff to continue to work remotely or from home? Have you considered the impact of loss of facilities such as processing plant and other physical assets? Your company and brand reputation is valuable so handling a crisis competently and with confidence is important. Consider all scenarios especially where negative stories could emerge? Have you prepared your messages to reflect these scenarios together with the need to communicate to your stakeholders? Are staff members trained to communicate efficiently and effectively?